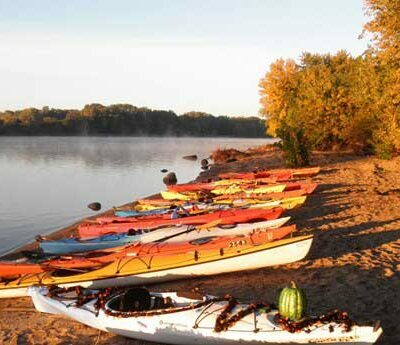 Escape for the day with a rental kayak or canoe in Morris, IL, located on the Illinois River. Kayak Morris, a local business, rents kayaks or canoes on a half or full day basis. Their rates are reasonable, and can include complimentary camping for two, turning your kayak trip into a day trip! The kayaks are in great condition and are of modern design, perfect for beginners and seasoned water enthusiasts alike. The Illinois River near Morris is very smooth and clean, and travels at a pleasantly brisk pace. An inlet, located a mile or so down the river, has a sand bar where you can get out to stretch your legs or wade in the water. 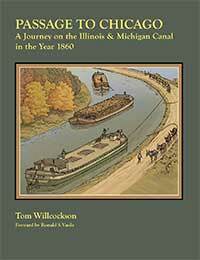 Also be sure to swing down the Mazon River on your trip. It is much smaller than the Illinois, and only accessible by kayak. The Mazon goes back about a mile or two, and is perfect for bird and wildlife watching. Water levels can present a challenge, so be mindful of the season when heading off the Illinois River. Please note that all bookings should be made in advance via text message (see their website). They are very quick to respond, and communicate via text for just about everything. Be sure to bring sunscreen as the river is very rarely sheltered, and a watertight bag with snacks and water. The tour is approximately 2 hours minimum, and a little planning goes a long way! Downtown Morris’ main street hosts food and drink staples Chapin’s, Montage Wine Bar, and The Sandlot. Distinctive shops line the streets such as Athletic Outfitters, Vintage, Whimsy, and more. Featuring several Cor-Ten Steel silhouettes and historical markers, Canal Port Plaza sits next to the I&M Canal State Trail, just south of downtown.